Incorporating the advanced technology of the M3V Control Group the FCU allows for a centralised control of Under Floor Heating (UFH) and Wall Hung Radiators (WHR) when installing a multi use system. The FCU can also distribute to UFH or WHR systems as a stand alone unit. Integral to the unit is the M3V composite control group which provides temperature and flow management to the Under Floor Heating system while allowing a T2 Topway Type 2 manifold to be connected to the inlet to supply higher temperature water to Wall Hung Radiators. This unit is ideal for use where systems have Under Floor Heating in the majority of the property but still require towel rails or Wall Hung Radiators in certain areas. This product allows the point to point plumbing principle to be used for both systems meaning less joints and therefore less chance of leaks. The M3V control group incorporated within the FCU Floor Control Unit includes a circulating pump, mixing valve assembly that can be thermostatically or electronically controlled, drain/fill valves, automatic air vents and differential pressure bypass valves. When controlling the mixing valve electronically the RCE weather compensating system can be used to manage the mix temperature depending on external weather conditions. Supplied with a M3V-F Control Group and a high temperature manifold with either two or three circuits for the connection of radiators or other high temperature heat emitters. Supplied with a M3V-F Control Group and a low temperature manifold with from 3 to 13 circuits for the connection of Under Floor Heating. High temperature heating can be added to the left hand side of the group if required. 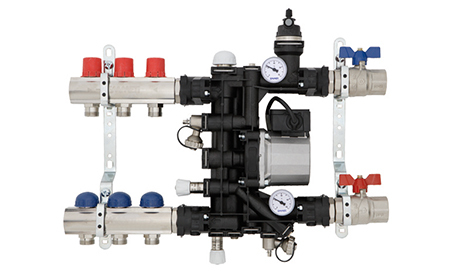 Supplied with a M3V-F Control Group and both high and low temperature manifolds for the connection of Under Floor Heating and high temperature heating (e.g. radiators). Supplied with a M3V-V Control Group and a high temperature manifold with either two or three circuits for the connection of radiators or other high temperature heat emitters. 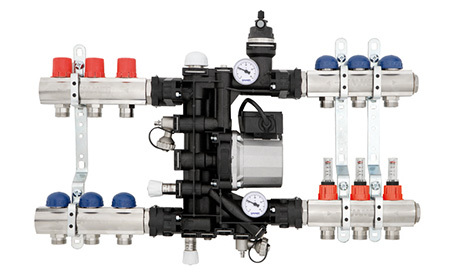 Supplied with a M3V-V Control Group and a low temperature manifold with from 3 to 13 circuits for the connection of Under Floor Heating. High temperature heating can be added to the left hand side of the group if required. 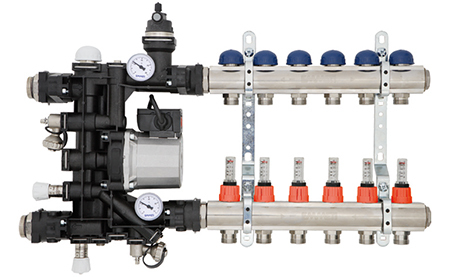 Supplied with a M3V-V Control Group and both high and low temperature manifolds for the connection of Under Floor Heating and high temperature heating (e.g. radiators). Can I have more than three circuits on the high temperature side of the Floor Control Unit? 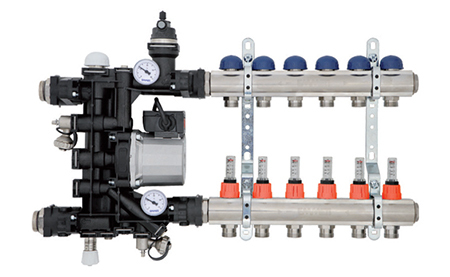 Yes, please add a single bar manifolds, for further information please contact Emmeti UK.